Hello my beauties! Today I am reviewing Caudalie's "Baume Gourmand Corps" Vine Body Butter. As you all know, this cold winter weather aggravates my dry skin, so I am all about the body butters lately! Caudalie is a luxury brand born out of a tradition of wine making in France. The founders discovered that the grape by-products from the production of wine were super rich in antioxidants. Theses antioxidants are incorporated into their skincare line. As the wife of a Certified Wine Specialist and a personal lover of wine, the Caudalie brand is highly appealing!!! 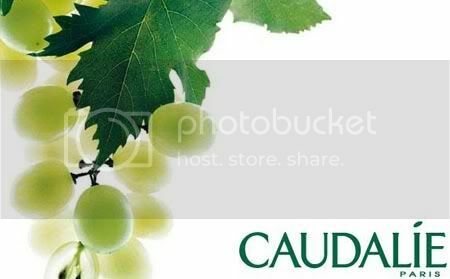 Background info on the Caudalie Brand: Wine Inspired Skincare! Co-founder of the brand, Mathide Thomas,comes from the Chateau Smith Haut Lafitte (Bordeaux) family of winemakers. After discovering that grape seeds that are thrown away after harvest are rich in polyphenolds (powerful free radical traps), the inspiration for the Caudalie brand was born. Grapeseeds: Grape seeds contain powerhouse polyphenol antioxidants (website states that polyphenols are "10,000 times more powerful that Vitamin E in combating free radicals). Also, rapeseed oil is very hydrating. Grape Pulp: Grape pulp is found to be rich in "Oligo-Elements" (not sure what this means, lol, but it sounds good!). Grape Stalk and Stems: These contain Resveratrol which is another antioxidant which "stimulates cell multiplication". The Blossom: Can be used as a scent. I must say, I am quite intrigued!!! As a wine lover and a product enthusiast, this merges two of my greatest interests! To read more background information, be sure to check out the Caudalie Website here. This is my first review in a series of upcoming Caudalie reviews. I will also be testing out and reviewing some facial skincare products from the Caudalie line (but will be testing those at length before posting reviews, stay tuned!!!). Ahhhh, this lotion has such a totally lovely scent!!! The scent just envelops you! Love, love, love the scent!It smells exactly like white grape juice (yummy!). A grape-themed scent is just what I was hoping for from this wine-inspired company. The scent is very fresh and light. It is very subtle on the skin and wouldn't interfere with any other perfumes or scents that you might wear. Or, it would just be lovely as your only scent on non-perfume days. It just smells clean and fresh and lovely!!! Also, it is not "too girly". My husband loves using this body butter, too (and I think he secretly loves the wine-theme as well being a wine-guy himself!). This richly moisturizing lotion is just so luxurious!!! What a treat for your skin!!! The body butter is very thick, but it spreads and applies easily (with minimal "drag" to your skin). It is non-greasy and absorbs quickly. Your skin is left feeling very soft and smooth. It is ultra moisturizing and great for those "extra dry" areas of your skin like your elbows and hands. It leaves yours skin feeling soft and looking pretty with a nicely moisturized "sheen". I really adore this body butter! Retails for about $28.00 for a 6.7 FL oz tube. Yes, its pricey, but the body butter is so concentrated that a little will go a long way. Thanks for reading my dears! Stay beautiful!